Two days of autocross at Traders World! Saturday, September 16, Miami Valley Sports Car Club (MVSCC) will host an event. Information and registration can be found on their website. Sunday, September 17, Cincinnati Region SCCA hosts our Points Event #6. Email the solo chair (solochair70@gmail.com) if you are interested in a chicken or pizza dinner at the site on Saturday. 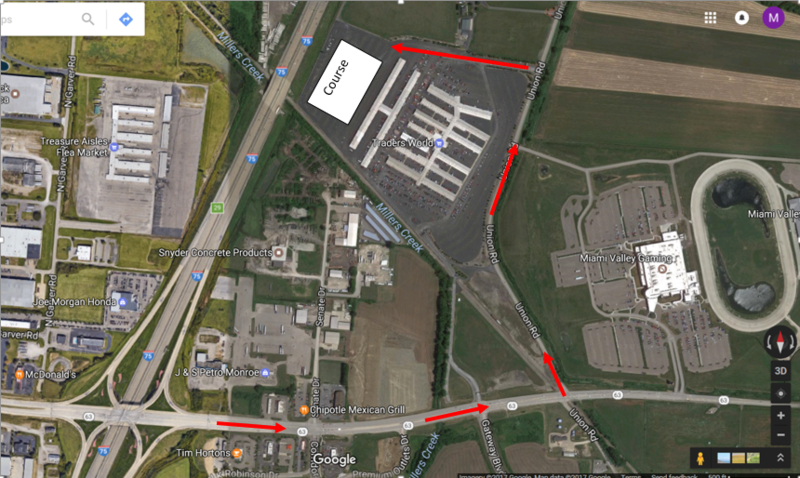 Important information on our new autocross site at Traders World, 601 Union Rd, Lebanon, OH 45036! Each vehicle entering the site must pay a $2.00 cash entry fee. Exact change is appreciated. Use the North entrance off Union Rd, near the railroad tracks. Do NOT use the main entrance on SR 63. No overnight camping allowed...gates are locked. Contact Kent at solochair70@gmail.com for recommendations. If you are new to autocross, welcome! Information on our events can be found here. Be sure to review the Novice Handbook prior to the event. For those new to autocross, the Cincy SCCA Region highly encourages participation our novice program. Those who register in our Novice class can be paired with experienced drivers to help with all aspects of the events (including driving techniques). Whereas it is highly encouraged, it is not mandatory but does offer the opportunity for novices to run with others at similar experience levels. Please preregister for events. You can pay at time of preregistration or at the site. Online registration really helps get our competition day off to better start and will save you a few bucks. When you register, fill out the registration form for the event as completely as possible and select the check box that reads "Save entry information to my profile." My Auto Events will remember your information and subsequent registrations will be much faster and easier. This also greatly reduces the number of errors in points scoring due to misspelled names, etc. It is important to always use the same name, spelled exactly the same way, for each event. Failure to do so will result in season points scoring errors. For index classes, identify your car with the index class and car number ONLY. For example, if entered in the Street Open (S) class with the number 12, your car should be identified as "12 S". There is NO need to put your base class on the car. Make sure your class and number are clearly visible from a distance. This helps a great deal in making our event operations run smoothly. If you have questions or need help with registration please e-mail one of the contacts below. All vehicles entering the site will pay a $2.00 cash entry fee. Exact change is appreciated. Use the North entrance off Union Rd. Do NOT use the main entrance on SR 63.